Also, the character is different than usual… Your characters are now sporting a bald look? Oh, Dhondu is back. No wonder he didn’t sell his book. I am no fan of self-help books anyway. LOL! 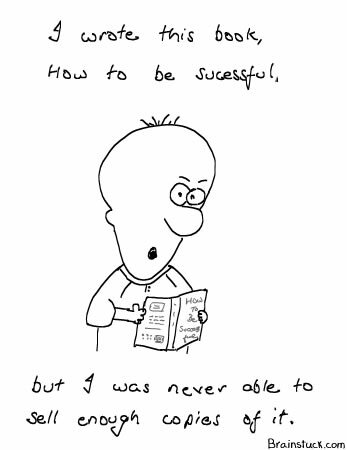 Success is a very relative term you know..
BTW, whats with the bloated head? New character being introduced to us?? ha ha, may be a book on How to be a failure, but that wouldnt sell either, but atleast it would prove his point! LOL! This is a cute character! self help books are written by those folks who need some help themselves !